Sustainable building, urban strategy is the key to an interesting built environment. What are cities for, if not for people? A recommended read for those interested in Berry after the by-pass.!! Support a sustainable urban strategy. Gehl is an architect and urban designer whose practice is well known for its attention to making public spaces that foster civic life. Underpinning his work is a critique of modern town planning’s penchant for traffic flow and hard-edged design, where the conditions of common space are overshadowed (often literally) by an emphasis on individual buildings and unengaging facades. 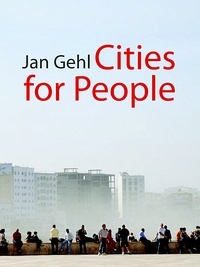 Cities for People continues this theme and articulates the theory that informs Gehl’s practice while drawing upon his considerable project experience across Europe, America and Australia. Central to Gehl’s vision for successful public space and the urban design that both promotes and sustains it is what he refers to as “the human scale” – the register of senses, instincts and responses by which humans instinctively negotiate their built and social worlds. This he opposes to “car scale,” with its “impoverished sensory experience” and disavowal of pedestrian bodies. The basic principles for designing an optimum liveable city thus relate to its capacity to service or complement human needs, articulated here as a desire for commonality, the capacity for play and creativity, and a dynamic engagement with place. There is thus an articulation, too, of an optimum human life, in which sociality is key. People, Gehl tells us, like being with other people. We like watching each other and sitting in proximity to others, but with instinctive boundaries, necessary for feelings of comfort and safety. Gehl’s city designed for people puts soft edges – those spaces in which people linger, gather and, importantly, engage with each other and their built environments, verbally, physically and kinetically – at the centre of things. The cyclist and the pedestrian, experiencing the city on a human scale and active in producing a soft-edged environment, complete the picture. For Gehl, Venice is a model city in this regard; Dubai is not. One of the strengths of this book is its accessibility. Gehl’s point is well made and clear. Despite the book’s unfriendly size and weight (this is not a book to take to bed), readers are easily guided by a rich range of cities and projects that have achieved the kind of public space and attendant culture that exemplify his vision. An abundance of colour illustrations and a concluding “toolbox” of planning principles contribute to this. As exemplar, Gehl’s practice in Denmark particularly figures, as does his evident admiration of Melbourne’s transformation of its barren CBD into a thriving and culturally rich mixed-use environment. The book’s final chapter offers a warning for the developing world, which is rapidly rejecting the human-scale and traditional bike and pedestrian cultures, as countries throughout Asia, Africa and South America embrace modernity. Gehl’s argument is enriched by its reference to sociology and human psychology and their significance to design. Gehl’s collaborative work with his wife (a psychologist) is on show here, as well as his earlier theorization of the “life between buildings,” meaning the need to integrate permanent form into the ephemeral life of the city. The book reiterates some familiar ideas that are not particular to Gehl, for example that inclusive and dynamic public space is crucial to successful civic life and that our environments shape us as much as we shape them. A small gripe is that – like many other writers on urban planning – Gehl uses the term “social sustainability” liberally, without interrogating what it practically means. It remains, in his hands, a baggy and unsatisfying euphemism for “wellbeing.” This aside, the author’s professional history lends a momentum to the book which presents its arguments as fresh and urgent.